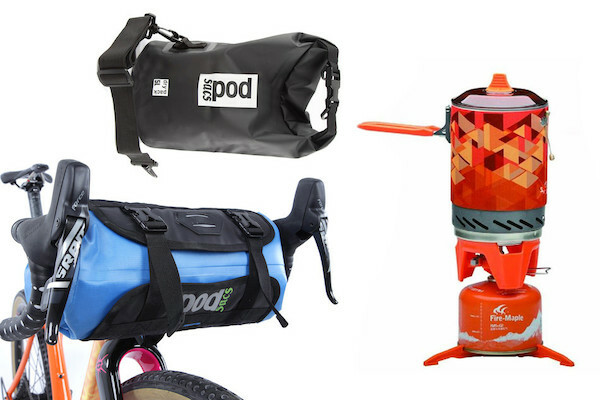 The PODSACS Handlebar Barrel Bag has quickly established itself as a firm favourite; weve shipped these all over the world to discerning bike tourers and adventurers. It integrates easily with almost any bar set-up, its easy and light to carry and has quick accessibility with a 7L capacity, 100% waterproof, removable roll-top barrel bag that sits inside a lightweight bar mounted sleeve. It's a great idea that combines load-lugging ability with campsite carry and waterproof storage all in one. Our 10L PODSACS Waterproof Dry Sack Storage Bag is perfect for trips away, its 100% waterproof, lightweight, durable as hell and comes with an adjustable shoulder strap for when you need to haul heavy loads. Its perfect for keeping your wet and dirty gear away from your dry kit, using as a waste carry bag on-site or even using to keep your gear safe and dry when risking life and limb by traversing frigid chest deep river crossings. However you use it, its a simply brilliant bag, built to last. With over 2kw - 2000w of power, these are amongst the best stoves out there. The Fire-Maple Star FMS-X2 Outdoor Cooking System really is everything but the kitchen sink; burner, heat-exchanger, a cooking pot with lid, grab handle and a stable footing system for use on uneven ground- add a gas canister and you are all ready to rock the campsite with your culinary prowess. The X2 model includes a larger cooking pot and improved burner over the more compact X3 version.